Out and about again today I am struck by how much water remains in the ground and on the surface. Meadows that are usually dry are now marshland and the local River Ver which so often struggles along has swelled to an impressive current complete with mini cascades over fallen logs and branches. Flocks of wintering gulls congregate on these temporary pools and no doubt pick off the drowned earthworms that lie palely at the bottom. If these floods had been combined with a freeze as well there would very likely be larger flocks of wintering ducks pushed southwards by even colder northern conditions. I did spot Teal and Gadwall on one pool along with the Mallards but no great numbers. Along the banks of the Ver I flushed a Snipe that rose abruptly in a classic zig-zagging flight – presumably an in-built defence mechanism against aerial predation. Otherwise the river was quiet and surreptitiously went about its business of flooding the surrounding meadows wherever the bank dipped low enough to allow a small stream to form. Eventually the path was blocked under water and I had to turn back but not before I had added six Little Egrets to the day’s list. These small white herons seem to have no limits to their expanding territory and elsewhere I have seen as many as twenty birds roosting together in one tree. When I was at school in the 80s and much to the excitement of local birders, Little Egrets were rumoured to be breeding in Poole harbour – one of the first and obviously successful pairs. 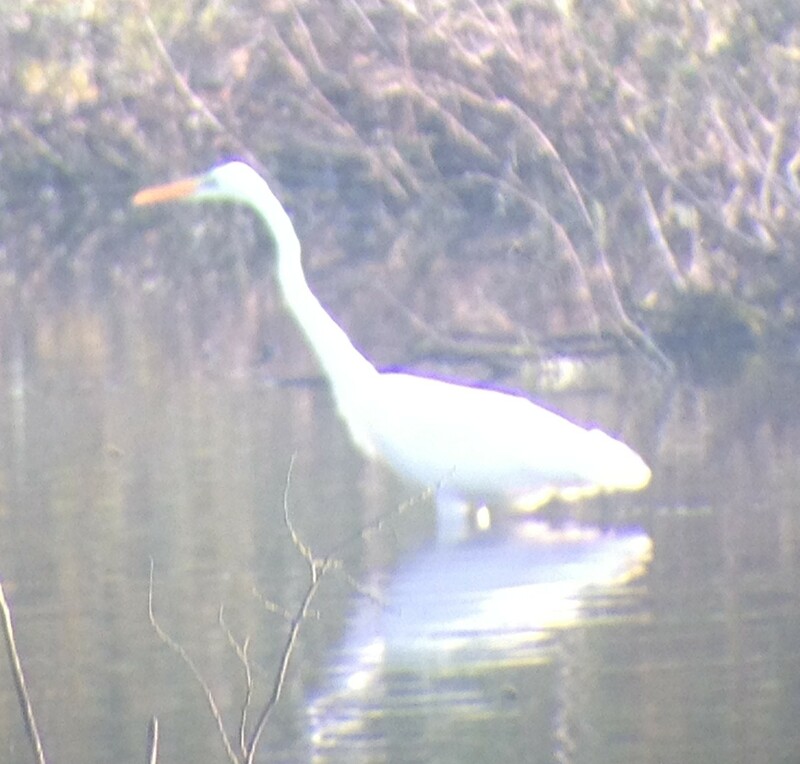 Now the invasion is complete and the much larger Great White Egret has decided to join its small cousin in ever increasing numbers. While still bit of a rarity, I don’t think it will be long before the familiar Grey Heron is joined by this rather more exotic and elegant, pure white relative. Let’s hope they get on! 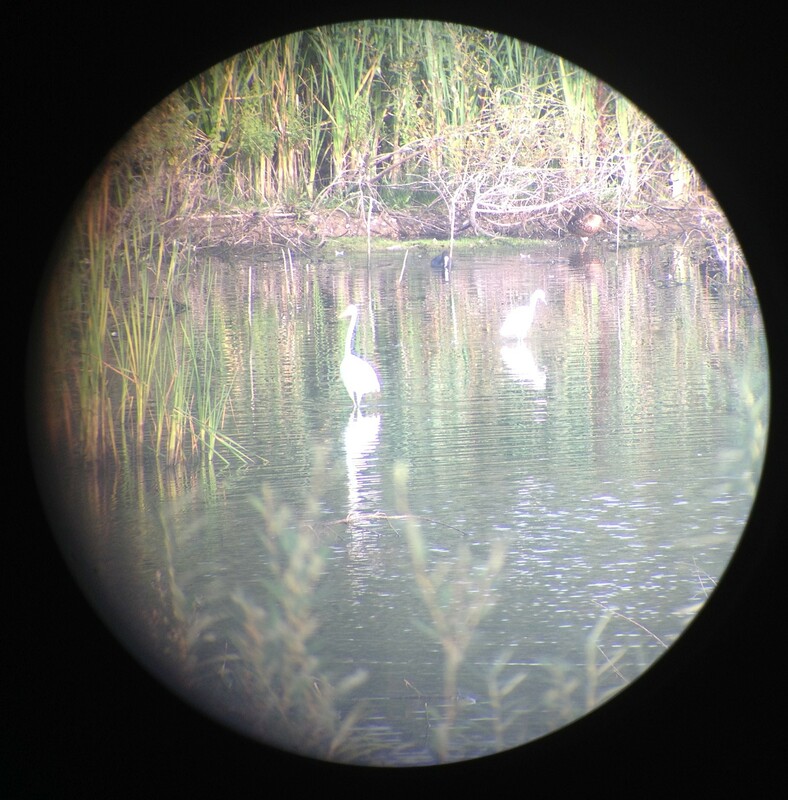 Here’s a couple of photos I took last year of a local Great White Egret that graced the local gravel pits for a few weeks along with the more regular Little Egrets (admittedly I wanted to see if my phone could capture the image in my telescope. The answer was yes, but poorly!). I too ventured out to enjoy the sun, without a coat and almost without a care. I was met with birds a-courting and some fast-track birds checking out viable nesting holes. In particular and very welcome to behold were a number of Tree Sparrows busy chipping and chirping in some old elms. I am very fortunate to live on the door step of one of the few remaining Tree Sparrow colonies, a species that has experienced a marked decline in this country in my lifetime. Today was as if the clock had been wound back with at least eight individual birds along their favoured hedgerow. Their distinctive calls reminded me of years gone by when it was not so unusual to expect a Tree Sparrow or two in an old half-dead elm tree. However, they all but vanished and thanks to the efforts of local groups and landowners putting up nest boxes, farming less intensively and putting out feeding stations, a few local birds have clung on and continue to stay all year round. This year looks to be a good year with up to thirteen birds being observed over winter. Our other English sparrow – the House Sparrow – is also experiencing its own decline. 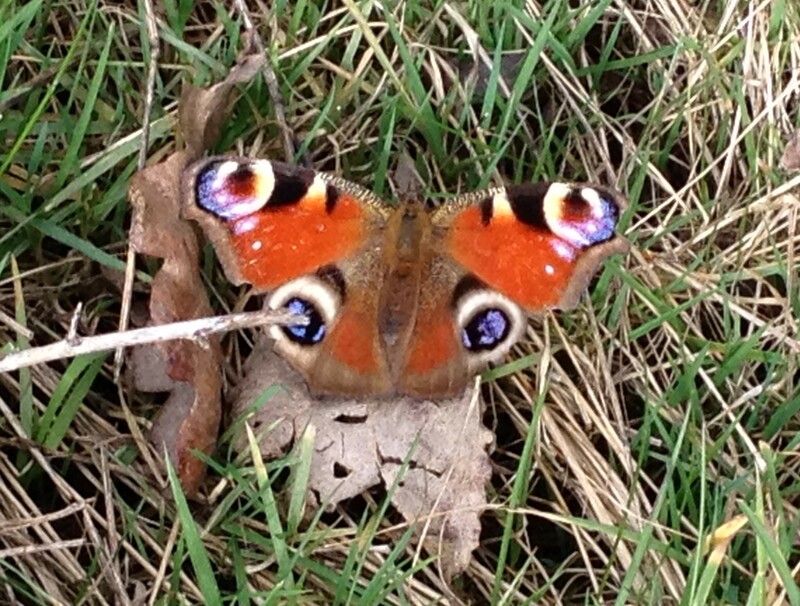 We used to have them in the garden but now they too have gone. If you encounter a flock on a walk through a farmyard you might be forgiven for thinking they must be common. However, these flocks are often isolated and the national picture has been one of decline. The BTO (British Trust for Ornithology) is in a race against time to discover exactly why this is the case. I still hope to attract them back to the garden. There is a small flock in a housing estate across the park behind our house. I’m hoping that the growing number of ducks and chickens in the garden might encourage them, like our friends, to view the place more as a farm than as a garden, with free food on offer! 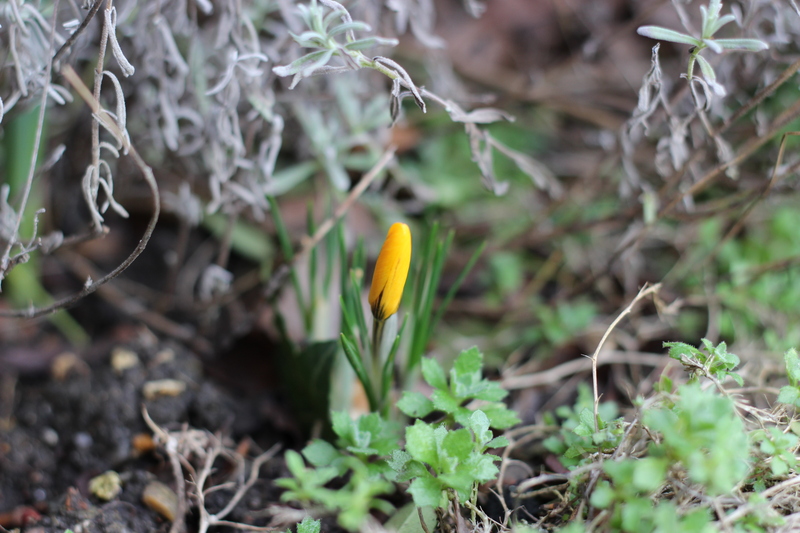 In case you don’t believe me when I say Spring is on its way I took some evidential photos in the garden to give hope and reassurance. 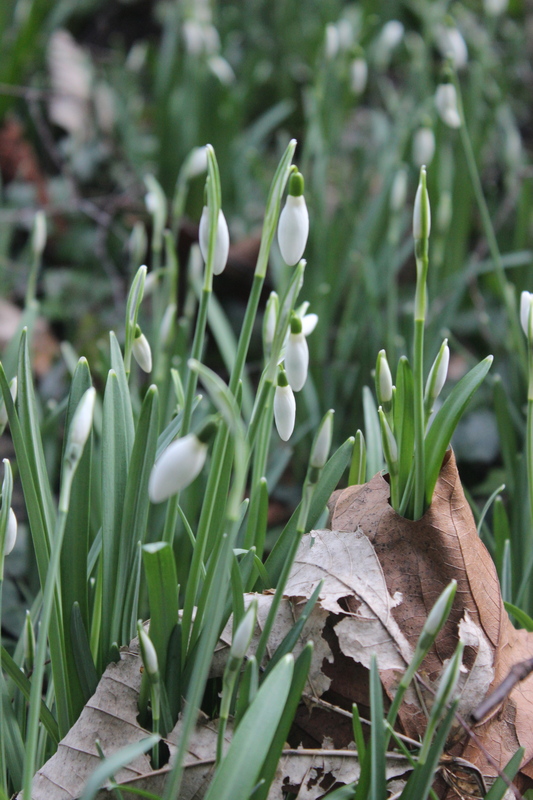 What I particularly like about the Snowdrops in the photo is that they are bursting through the dead leaves! They look like sharp arrows of life shot straight through the decaying shroud of death. Maybe a bit dramatic (!) but it never ceases to amaze me how I can lift up a pile of dead leaves at this time of year and find green shoots beneath. I think biologists would refer to this growth as ‘photo-tropic’ – a growth upwards stimulated by light. Equally the roots below are ‘geo-tropic’ and are drawn downwards into the ‘geo’ by gravity. That’s all I can recall on the subject from my days of A-level Biology without defaulting to Google, but I seem to remember being impressed at the time at the mystery of why stems grow up and roots grow down. On Saturday I got up early and drove to the Essex coast for some winter bird-watching. Getting to the coast, and in particular being out on tidal salt-marsh and mudflats on a cool, clear day is something I always look forward to in winter. The rest of the family just sees mud so I didn’t invite them. For me though it is thrilling spectacle with a rarefied atmosphere created by thousands of wintering water and wading birds. There’s never a dull moment and I was struck this time as to how constant movement was the order of the day for the mudflat inhabitants. Not only would vast flocks of Lapwing, Dunlin and Golden Plover reel into the air at the slightest perceived threat but the tide itself, having retreated to expose the muddy feeding grounds, suddenly turned and without delay began to race back across the mud again. This in turn forced the many flocks of feeding birds to move every few minutes, en masse, to higher ground. I did encounter a couple of birds that had declined to join the constant state of agitation. Their refusal to rush around served them well as feared predators whose perspective allowed them to pick out their quarry amidst the confusion and chaos of tidal life. One, a Peregrine falcon, sat quietly on a low post in the middle of the rising tide while the other, a Marsh Harrier, soared effortlessly above the swirling masses. Both waited for their moment to pounce, the Peregrine cutting like a knife through the swathes of waders and the Harrier suddenly swooping from above pick off the unlucky slow-coach. This spectacle never fails to capture my soul, not least because it is played out in wild and beautiful landscape that assaults the senses. The low sun, although unable to reduce the chill, brightens everything in view. The sparkling mud flats simmer and fizz as the water retreats allowing the mud to breath, albeit briefly. The sea breeze dispatches the last of the dead leaves from the shoreline trees and alerts the land to wake up and look for the coming spring.